I joined this awesome group of teachers on Facebook who support and encourage each other! As part of this group a few of them started a collaborative blog and will also be doing some link up parties! This is our first link up! We are introducing ourselves to everyone! Love this form! It is so fun and creative! I have been teaching Early Childhood Special Education for 9 years and this year I will be doing some teacher consulting for students and teachers, with a large amount of time spent in kindergarten with our students who are transitioning from the ECSE Classroom. I love kindergarten and the amazing teachers that teach them! I have always worked closely with the kindergarten teachers in our district by implementing a big buddy program where the kindergarten students were the preschool special education students big buddies, which is something they never get to be, so they were very excited and proud of this role! The kindergarteners were great language and social models for our students! I am a mom of a two year old daughter and a wife to an amazing and supportive husband who is letting me journey into part time for a short period of time to enjoy and support our daughters growth! I cannot live without my Scotch laminator! It is a lifesaver, and the quality is so much better than our schools! 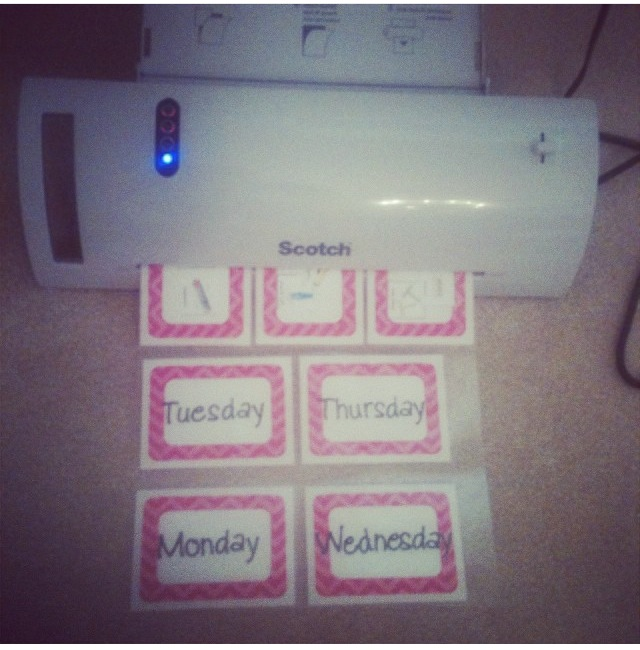 So anything I need to hold up for long periods of time I laminate with my personal laminator! One of my favorite books for teaching students about others with disabilities is Special People, Special Ways written by Arlene Maguire and illustrated by Sheila Bailey! Always a good one to have on hand for any grade! Thanks for visiting my blog! Hope you took a look around! Feel free to follow on any of the many social media sites at the top right of this blog! Click here to go back to the original page! Love that you put laminator!!! I would be SO lost without mine! I just bought a second one so I can keep one at school and one at home. Is that considered an addiction?? Haha thank you for linking up with us!!!!! Thanks for including us! I need to buy one for school as I would have find myself taking it back and forth last year! Might need to invest in another! We have a program similar to yours. Our staff kids that are 3 and 4 can attend daycare at the school and are the role models for our special needs kids. I haven't heard of that book before. I'll have to look it up! Thanks for sharing. That is really cool! What an awesome idea! Oooh I forgot about my laminator!! I definitely can't live without that! I need to check out Special People, Special Ways (I need to start a list of all of these favourite books!!) And the big buddy program sounds SO neat!! 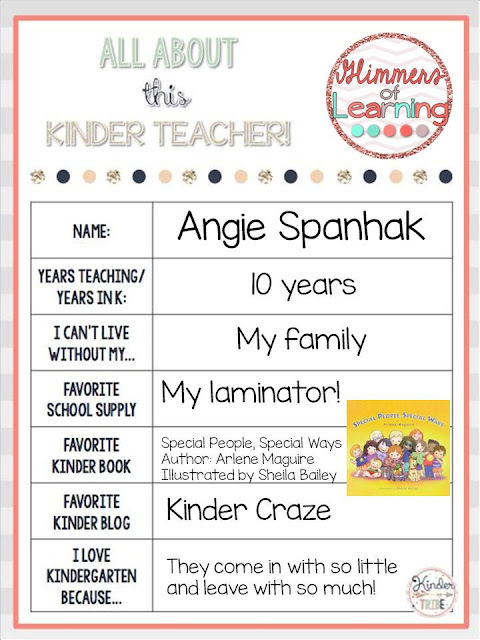 Yes a laminator is a must! love it! I LOVE the buddy program! I can see how that would be powerful for everyone involved! That is something I'd love to do this year! This is crazy, but I actually just ordered my first laminator today! I was always kinda iffy because of the price, but I finally decided that I needed one! I can tell it will soon be something I can't live without! A big buddy program is awesome! Let me know if you need any tips! Also the book I mentioned was something I read to students before starting the program as we were working with kids with special needs! You will love your laminator and won't be sorry you made the purchase! Hi Angie! So excited to meet you & be part of our new "kinder family"! I'm really looking forward to sharing & collaborating with you and our "tribe"! I love your blog! I love this collaboration too! Thanks for your support and checking out my blog! Aww yes I love your reason for why you love kindergarten, it's so true!! It feels so good to see their amazing growth! Isn't it amazing the growth they make in one year! Such a fun age! OMW!! A teacher after my own heart!! How did I make it so long without my own personal laminator?! Enjoy your time with your baby, it is so worth it! I look forward to reading more from you and your blog! Thanks so much! I can't wait to spend more time with her, etc! So excited to meet you!! Your family is adorable! 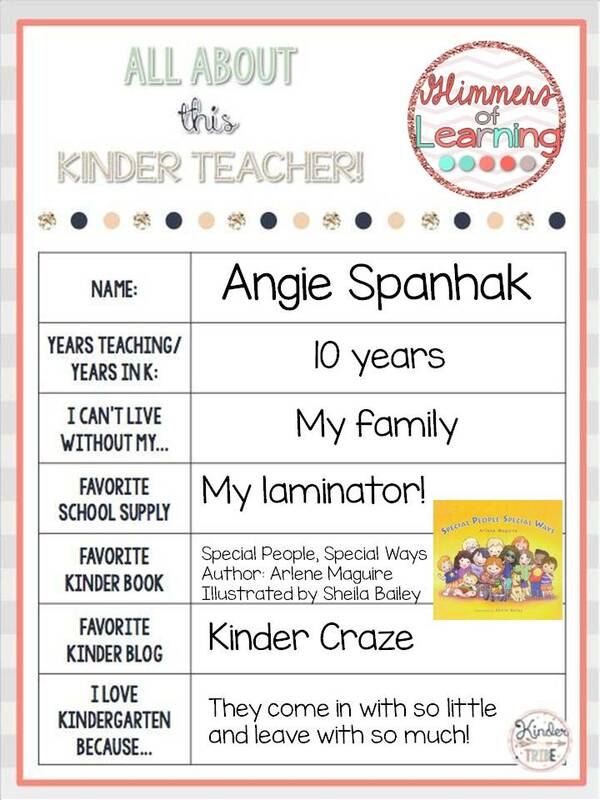 I also could not live without my personal laminator!! 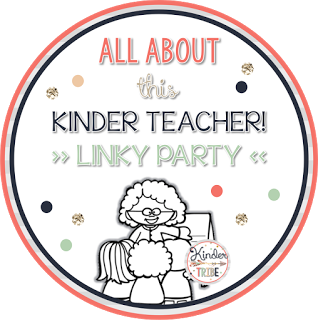 Thank you so much for linking up for this all about the kinder teacher! I am your newest follower!! Thanks for following! Headed over to your blog right now!